Tiger Woods, one of the greatest golf superstars every to play the game, came out a few years ago with the book, "How I Play Golf". 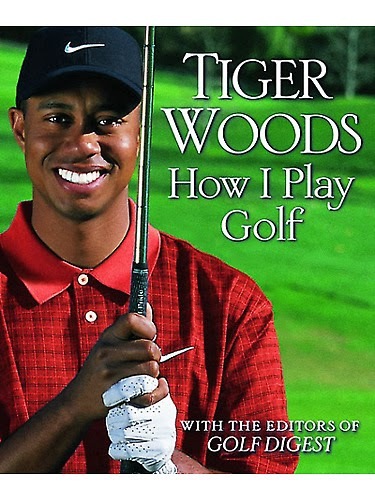 Perhaps Woods should re-read the contents or create an update entitled "How I Should Play Golf ." Several writers have analyzed Tiger's 2014 game, especially after his horrendous performance at the Farmers Insurance Open. 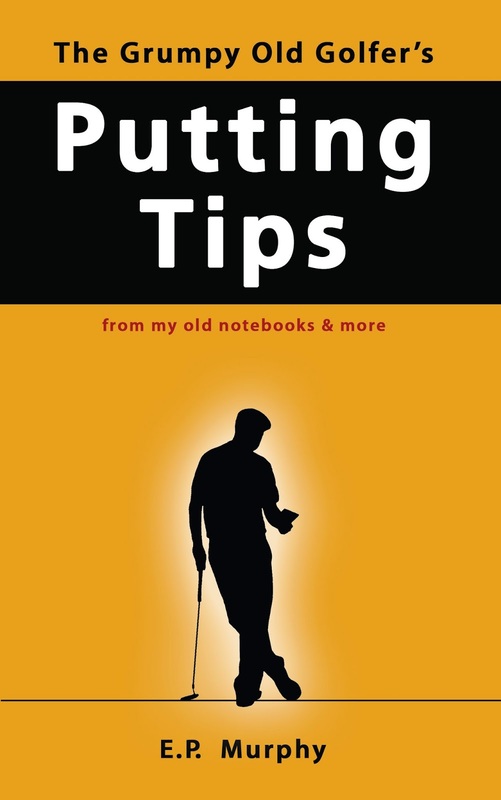 Golf for Beginners has selected several golf tips from "How I Play Golf" which we hope will be helpful to Tiger Woods in light of his recent shortcomings. Lack of Practice - Jim McCabe mentioned on GolfWeek that, "because of his age, injury history and custodial duties as a divorced father, there's no way he can practice and prepare himself like he used to, when he was in his 20s or early 30s." Tiger, please refer to page 205 which states, "When you're on the Course, all that hard work starts to pay off." 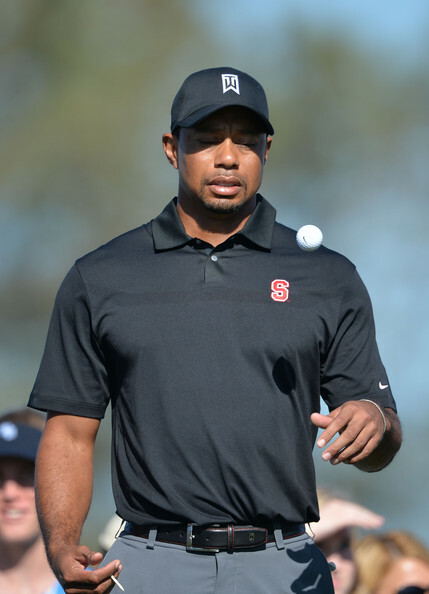 Unprepared- Golf Week's Jeff Rude stated that Woods was unprepared for his season debut with Rude quoting Golf Channel Analyst Chris Chamblee as saying, "The golf swing I saw today looked like a 55-year-old man out there." OUCH! So what is Tiger to do to improve his overall swing? Tiger, please refer to page 85 where you sat down, watched and analyzed your recorded swing and then commited to change. As Woods states, "The goal is to have a repeatable swing that is mechanically sound, repeatable, works with every club in your set and holds up under pressure." Too much muscle -Hank Haney, on his radio show, expressed disdain for Tiger's muscle gain believing that, "when he was thinner and younger he was actually faster." ...hmm remind you of David Duval? Instead Woods should work on stretching more than building. Tiger's advice in Chapter 11, "I don't know how much stretching Sam Snead does, but I'm told he is one of the most flexible athletes ever." Mental Game Adjustment - After his poor showing at the Farmers Insurance Open, Woods said, "There was nothing different with my ball-striking today (Tuesday) compared to last Saturday." ..."It was just one of those days that happens, and it was one of the trains I just couldn't get off." Woods needs more visualization, less anger. In Chapter 10, Woods states, the key is not letting distractions affect your performance. "I refuse to yield to pressure," argues Tiger. Finally, it would be helpful for Tiger Woods to remember, as it says right in the beginning of his book under "First Things First", "Golf is a never-ending journey. Before we begin, we should look at where we've been." Voice your opinions on Twitter @Golf4Beginners and Like on Facebook. 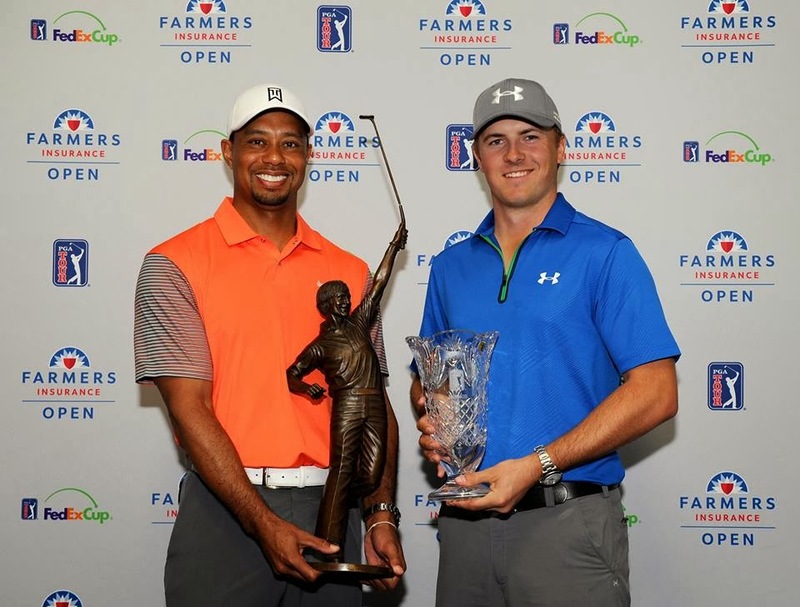 Is the Tiger Woods, Mickelson Battle for TV #Golf Supremacy Finally Over? With Tiger Woods and Phil Mickelson debuting their PGA Tour golf games at the Farmers Insurance Open at Torrey Pines, fans are anxiously awaiting the Battle of the Tried-and-True Superheroes ...or are they? Online conversations are conflicting about where the most TV action will come from this week- Golf Channel's Facebook page has a proud Tiger Woods accepting his 2013 Player of the Year Award along with Jordan Spieth (Rookie of the Year) with Woods contemplating a new entrant onto the battlefield, "It's going to be fun for a number of years battling it out," Woods was quoted as saying at the ceremony. With Spieth and Woods teeing off with Jimmy Walker on Thursday, this pairing could most certainly turn into a future Sunday moment...although both Woods and Spieth have their work cut out for them with a pair of even scores on day one. Expert picks mainly have Tiger Woods as the golfer providing the most action and as the winner this weekend but Woods and Mickelson, "the two biggest stars of their generation" as Fox News aptly states, may not be the only attractions worthy of prime TV time....could Stewart Cink be the man to watch? Two long hitters, Bubba Watson and Phil Mickelson, will certainly give viewers the action they seek as they tee-off along side of Aussie Jason Day. You can always expect a few fireworks from both left-handed golfers - Mickelson nearly chipped in from the parking lot to make birdie at eighteen while Watson had some chip action of his own on hole number two at Torrey Pines' North Course. You never know when a new battle will brew or the excitement will kick up a notch - Tiger Woods and Phil Mickelson are both great golfers but new rivalries can happen in a heartbeat to create an infusion of excitement into the sport. Without picking Woods and Mickelson, which golfer do you think will provide the most drama at Torrey Pines this year? Voice your opinion on Twitter @Golf4Beginners and Like on Facebook. Men love to play golf for a number of reasons, but every guy is similar in a few ways. Every man wants to have nice golf clubs, a nice golf bag and attractive, stylish golf clothing for the course. There are cases when guys wear golf clothing every day because it is casual yet very elegant. Choosing the right kind of golf clothing for men is essential to the personal wardrobe of many men and their look on the course at tee time. Guys who enjoy wearing golf clothing are not bound to a particular wardrobe. Payne Stewart wore knee-high socks as an homage to the history of the sport. Tiger Woods wears red every Sunday and Adam Scott looks good no matter what he wears. Depending on the guy's sensibilities, there is a line of clothing that will fit perfectly in his closet. Every man enjoys picking out smart-looking golf shirts. In fact, there are many men who wear golf shirts for work with dress slacks. The sleekest of polo shirts are made from pima cotton with a sheen that makes them look akin to dress shirts. Other polo shirts are a little bit more casual but they still look nice enough for work. The guy who hits the course in his favorite golf clothing enjoys playing the game more because he feels good in his clothes. Also, the man who doesn't necessarily accessorize in his every day wardrobe has no choice but to accessorize his golf wardrobe. When a man is choosing his golf wardrobe, he can have a nice golf hat, visor or cap that looks just like what his favorite golfer wears. From the traditional golf cap of Payne Stewart to the Aussie hat of Greg Norman and the visor of Phil Mickelson, every guy can dress like his favorite golfer. When choosing appropriate golf clothes, men can get all of the clothes that will work for them on the job, on the course and allow them to look good on the course. Golf clothing for gentlemen is a style choice that will stand the test of time. Voice your opinion on our Golf for Beginners blog, on Twitter @Golf4Beginners and Like on Facebook. A seemingly beautiful golf event turns from sunshine to soaking rain in a matter of minutes...but, is your round ruined? 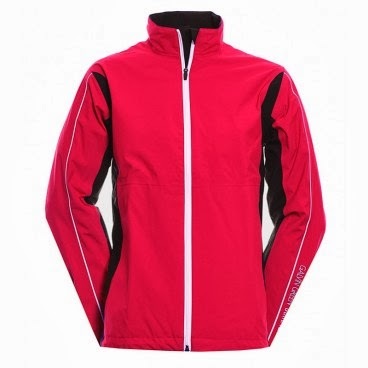 Most players do not have the luxury of rescheduling eighteen holes to another day, so you carry on, pulling out of your bag your waterproof gloves and one of your stylish waterproof golf jackets from Galvin Green. Can playing in the rain also be a fun experience? Of course it can, with a few golf tips under your belt! 1. Five-time Briitish Open winner Tom Watson knows about playing in adverse conditions. 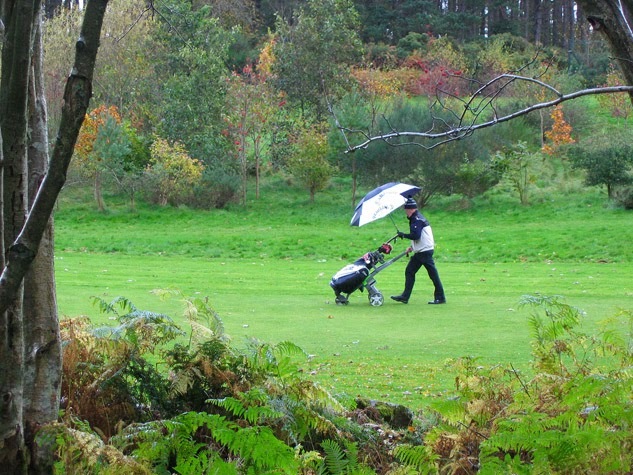 His top weatherproof swing tip? Aside from always carrying a lightweight rainsuit, Watson says, "from a wet turn, swing your irons on a shallower (flatter) plane so you pick the ball off the grass without taking a divot. If you hit even slightly behind the ball, the club will dig too much into the wet ground. When the conditions are wet, a thin shot is better than a fat shot. Plus, a thin shot will probably still stop on the green if it's wet." 2. Don't overswing like Phil Mickelson says Doug Wade, head golf professional at Miami Valley Golf Club. Thinking back to a classic pull from Mickelson at Quail Hollow which resulted in a loss, Wade says to stay in control, shorten your golf swing and swing easy. 3. 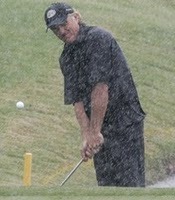 The Shark, aka Greg Norman, says to "keep yourself and your equipment as dry as possible." "If there's one part of your body to keep dry it's your hands. Once you lose your grip, you lose everything, so keep your hands in your pockets except to play. Also, be sure to keep the top of your golf bag covered so that rain doesn't drip down the shafts and get your grips wet." I will add to this tip that you should make sure you keep a hat in your golf bag and, as Tiger Woods sometimes does, turn the flap upward to allow water to pour away from your face. 4. Golf Channel Swing Instruction says you will need more carry from the tee. I would add that you should consider taking an extra golf club during most of your distance shots as the ball will not travel as far nor will it roll on soft, wet ground. Be sure to check out the range of Nike golf clothing from Function18 before hitting the links! Voice your opinion on this golf blog, on Twitter @Golf4Beginners and LIKE on Facebook.